as played out in endless re-runs of the Nazis. A tide of racism, nationalism, and authoritarianism is sweeping the world. With the world economy hobbled by debt and stagnation, society being torn apart by austerity and inequality, and a political system paralysed by corporate power, support for the Far Right is surging. 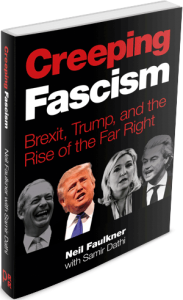 This new book by Dr Neil Faulkner and Samir Dathi argues that we face the clear and present danger of ‘creeping fascism’.